We spend a wonderful week in the very functional and clean house. The pool was great. But it is the stunning view over the italian country side that does this place unique. Very recommendable. Det mest fantastiske velholdte, veludstyrede og ugenerte hus samt have med alt hvad man behøver. Poolen er smukt beliggende med en fantastisk udsigt, skønt med saltvand i poolen og dejlig udendørs bruser med varmt vand. Domenico var meget hjælpsom og provianterede os med skønne grøntsager. Paradis på jord ! La Terverna i San Leo Bastia er bestemt et besøg værd, lokal god mad med fin betjening. 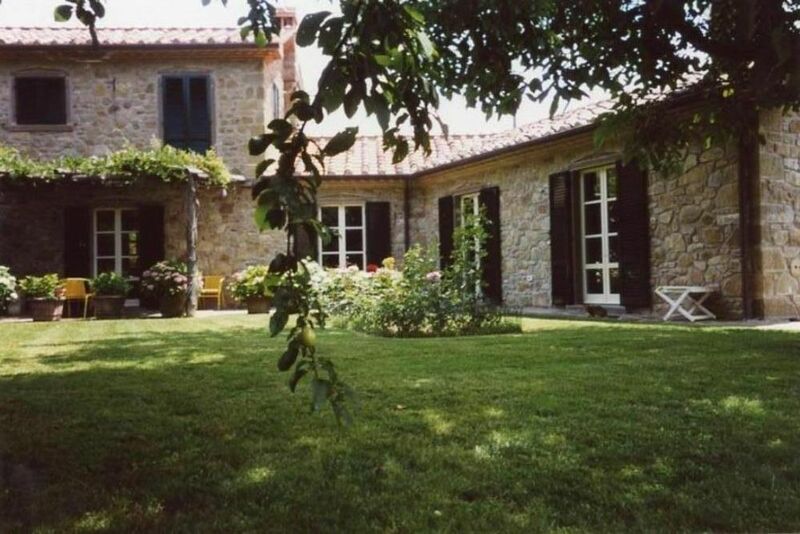 A beautiful property run by a lovely family in the middle of the Umbrian countryside. A perfect base to explore Umbria with hour, hour and a half trips to Assisi, Gubbio, Orvieto, etc. Absolutely gorgeous setting and surroundings. The house is well-maintained and has everything one needs to have a relaxing holiday. It’s advisable someone in your party speaks some basic Italian to communicate with the hosts. We visited in September and needed bug repellent as mosquitoes were everywhere. Other than that perfecto! We thoroughly enjoyed two weeks at Casa Stella. The house was welcoming and comfortable and felt safe and homely from the start. The hospitality of Domenica and his family was exceptional and they really took excellent care of the house and the pool for you. Their generosity with things from their garden was so kind and thoughtful.The views from the pool are absolutely stunning, we were sad to leave and would recommend it very highly. Propreté , accueil parfaits ! Tres grande maison avec piscine tres bien entretenue et vue sublime . We were a party of four. Arrived late Saturday evening after a long drive from Pisa airport, eventually located the villa as darkness was upon us, the property sign was not easily located. Dominico guided us around the accommodation and we soon settle in with the help of a few glasses of wine. Wow, what a surprise next morning, a lovely warm sunny day and a walk around the grounds revealed a pool located on its own terrace with far reaching views across truly magnificent countryside (this view was not visible on arrival but our host had shown us the pool). A bonus for us was the morning chorus of frogs and birds, especially nice was the call of the nightingale and the screeching of the swifts, sounds that are becoming rare in the UK. The kitchen is very well equipped and spacious enough for us to work together in preparing meals. Local fresh food was purchased from the Conad supermarket located neat Trestina (approx 9km away). The lounge was enormous and the main bedroom vast. We were located in the upstairs room and despite having two single beds, we were able to push them together. Bathrooms were well appointed. Fresh fruit and vegetables by far better than that purchased at our UK supermarkets). Our weather was mixed but spurred us into visiting 4 places of interest - Cortona, Gubbio, Citta di Castello and Castiglione del Lago - all offering attractive walled towns with many churches with impressive fresco's and places to eat. May was early for perfect weather and the pool was cool but I was always in for at least 2 - 3 swims a day, not so for all our party. If you wish for peace and quiet, beautiful scenery and ability to drive to attractive towns (without too many tourists! ), plus have a spacious, clean property and an attentive host then this is the property for you. Dominico supplied us one evening with some freshly picked broad beans that where delicious with our homemade risotto. Additionally, he cleaned the pool every morning, checked with us that all was OK and presented us with a scrumptious gateaux. Tag A1 (Bologna-Roma) - Exit Bettolle-Valdichiana hen imod. Cortona. Supplemento per il riscaldamento in inverno. La consegna delle chiavi viene effettuata dal proprietario presso la casa. Non ci sono spese aggiuntive.